Completed Contractor’s Material and Test Certificates, signed and dated, for the underground and aboveground piping. 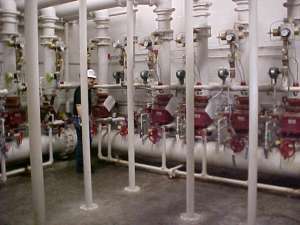 These documents need to include the test results of the main drain (static and residual pressures), local alarm (indicating maximum time to operate), and dry pipe valve, if applicable (normal air pressure, trip time, trip point air pressure, time of discharge at the inspector test outlet). Installation methods or designs which do not meet minimum NFPA standards, systems that are designed for life safety, and/or systems that have inadequate water supplies, will receive little or no fire insurance loss costs credit. Credit is subject to verification of sprinkler installation and conditions existing at the time of final inspection. If at all possible, we recommend that a preliminary “cover” inspection be scheduled before the ceilings are installed. The majority of AFA installations are installed to comply with local municipal ordinances rather than for fire insurance rate consideration. 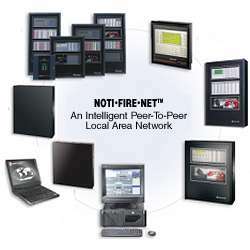 Local ordinances are generally structured towards life safety rather than property protecting and permit less than full coverage, often require only local alarm or permit connections to unlisted monitoring centers and permit a lesser frequency of inspection and testing than specified by the nationally recognized standards which we employ for insurance inspections to evaluate installations for possible fire insurance rating. The increased cost for compliance with the national standards to achieve fire insurance rate credit may not be fully amortized by reductions in insurance premiums. The manufacturer’s specification sheets for all alarm equipment including control panels, detectors, and transmitting devices. All system components must be UL listed for the proposed use. A completed copy of the Fire Alarm Certificate of Completion. A copy of the maintenance and testing contract specifying frequency of inspection and testing by a qualified party. A copy of the alarm system installation plans, detailing detector location and spacing. Note: Maximum allowable detector spacing should be based on both reductions for ceiling height and solid joist construction where applicable, as specified in Sections 5-2.4 of NFPA 72, using maximum roof height at peak. Also, include structural plans, including a building cross-section detailing roof construction with dimensions and on-center spacing of roof structural members and roof height. Alarm signals must be monitored by an approved location, generally a UL listed central or remote station or a fire department dispatch center. Signal transmission must be by an approved means. The use of digital alarm communicators which operate through long distance telephone exchanges are not acceptable. Listed digital alarms communicators operating over local telephone lines are eligible for limited credit only. Retransmission from central station to fire department (if applicable) must also be by an approved means and must generally employ the use of at least one supervised line with additional credit for provision of two supervised lines. In the event that monitoring, maintenance and testing are performed by different parties, the UL listed central or remote station should hold the primary contract with the protected party. For full central station alarm credit, the installation must be certificated or placarded and runner service must be provided as specified by NFPA 72. Provision of primary electrical power to the alarm equipment must be from a dedicated circuit. Plug-in type transformers are acceptable only if installed in a protective enclosure and the receptacle is isolated from any other use. System wiring, including electrical and telephone wiring, should be protected from physical damage. Conduit or rigid raceways are acceptable means of protection. The Public Protection Classification (related to fire hydrant distribution, available water supply, and fire department response capabilities) must be Class 8 or better at the building. “As-built” hood and duct plants showing dimensions, gauge of metal, method of fabrication, duct enclosure, clearances, etc. “As-built” diagram of the fire extinguishing system showing pipe sizes and lengths. Location and types of nozzles, location and types of electric and/or gas fuel supply shutdowns for cooking appliances, dimensions of cooking appliances, and location of manual actuation device. A contractor’s letter of certification that the automatic fire suppression system installation is in conformance with the Underwriters Laboratories’ listing and the manufacturer’s installation manual for the system. A completed and signed maintenance stipulation for the fire extinguishing system in question. Troughs or gutters are not permitted except beneath the filters. An Underwriters Laboratories, Inc. listed grease extractor may be installed as an option to the approved automatically operated fixed-pipe extinguishing system for protection of the duct and plenum areas. Cooking equipment, such as deep fry fryers, ranges, griddles, and broilers require protection by approved extinguishing systems. The operation of any extinguishing system must automatically shut off all sources of fuel and heat to cooking equipment as specified in NFPA 96. An inspection and servicing of the extinguishing equipment is required every six months by properly trained and qualified personnel. Certification of inspection and maintenance contract should be readily available for review. Ducts must extend above the building a minimum of 18 inches with at least 40 inches from the exhaust outlet to the roof surface. Exhaust outlet is considered as the base of the fan, or blower housing, unless construction of this housing is equivalent to construction of the duct or the fan is UL listed for commercial cooking equipment. 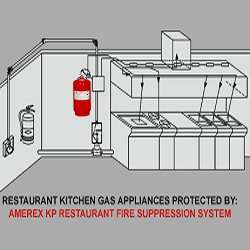 An approved fire extinguisher with UL rating, as stated in NFPA 96, is required in the kitchen area. Only Class K extinguishers are recommended for cooking grease fires. Hoods, grease-removal devices, fans, ducts, and other appurtenances are to be cleaned at frequent intervals. NOTE: Basic requirements for proper installation and maintenance are contained in NFPA 96 “Standard for Ventilation Control and Fire Protection of Commercial Cooking Operations”. Construction and installation of the hood and vent in accordance with the following comments may result in improved fire insurance rates. Hoods shall be a minimum of 18-gauge steel or 20-gauge stainless steel. Ducts shall be a minimum of 16-gauge steel or 18-gauge stainless steel. All seams and joints shall be constructed liquid-tight with an external weld. Ducts shall extend above the roof so that there is at least 40 inches of clearance from the discharge outlet to the roof surface. 18-inch clearance shall be maintained to combustible materials from the hood, vent and fan in the open (unless protected in accordance with NFPA Publication No. 96, Appendix A). Grease filters shall be of a type which has been UL listed for use with commercial cooking. Troughs and gutters are not permitted except beneath filters. Exhaust fans shall be mounted outside of the building. Installation of the fire extinguishing system in accordance with the following comments may result in improved fire insurance rates. Manual pull station must be in direct path of egress and be located not more than five feet above the floor. Height of the system nozzles over cooking surfaces shall be in conformance with the installation manual. Multiple systems in the same hood or more than one hood with a common exhaust duct less than 125 feet in length from any hood requires that the systems be connected in tandem to discharge simultaneously. A UL listed 40B:C rated portable dry chemical fire extinguisher is required in the kitchen area. Multipurpose types are not recommended. An automatic shut-off for all sources of fuel and heat to all cooking equipment is required to be a part of the extinguishing system and should operate if the extinguishing system goes into operation. Broiler drip pans are to be protected as outlined in the installation manual. Installing Contractor’s Certification Letter must be on file. All comments and acceptances relate exclusively to the relative effect of various conditions upon fire insurance rates. It is not to be construed as bearing in any way upon the question as to whether “due care” has been exercised with respect to possible liability for personal injury or damage to property. It is recognized that correctable hazards which could cause or contribute to loss may still exist and need not be identified or commented upon. Batt-type insulation attached to metal floors, walls, ceilings and/or roofs need to be UL-listed for a flame spread rating of 25 or less. Our representative will need labels from the packages showing the flame spread rating of the insulation used. Ceilings suspended below or attached to the metal roof assembly need to be UL-listed for a flame spread rating of 25 or less. Our representative will need labels from the packages showing the flame spread rating of the product used. Built-up insulation and water-proofing assemblies, installed on unprotected metal decks, need to be installed in exact accordance with a specific design, listed as “Fire Classified” in the Underwriters Laboratories, Inc. Building Materials Directory, in the section titled “Roof Deck Construction – Metal Deck Assemblies.” Our representative will need a letter from the architect, builder or installing contractor indicating the design number and certifying that the UL-listed specifications exactly describe the installation. Insulation sprayed on metal floors, walls, ceilings and/or roofs needs to be UL-listed for a flame spread rating of 25 or less. Foamed plastics are not acceptable, even if UL-listed. Our representative will need a letter from the architect, builder or installing contractor, stating what product was used and that this product is UL-listed for a flame spread rating of 25 or less. Insulation blown, laid or poured on top of floors or ceilings, or into concealed spaces need to be UL-listed as non-combustible. Our representative will need labels from the packages showing that the insulation is classified as non-combustible. Wooden components attached to the structure need to be “fire proofed” by a pressure treatment, UL-listed as non-combustible and used in conformance with the listing. Our representative will need a letter from the architect, builder or installing contractor indicating the material used and certifying that it is UL-listed as non-combustible and was installed in accordance with the listing. Our representative will assume that concealed spaces, and other areas which cannot be inspected readily, contain combustible materials unless a letter from the architect, builder or installing contractor identifies all materials used in the concealed spaces.